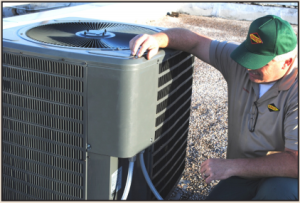 The average lifespan of a heating and air conditioning unit (HVAC) is between ten and twenty years. However, the actual lifespan also depends on how well you take care of it. While having an annual maintenance plan is the best option for increasing the lifespan of your HVAC unit, there are also little tasks that you can perform that can eliminate potential issues. For example, forgetting to change your air filters can significantly reduce the life of your unit. Remember, your heating and air conditioning unit should be considered as an investment in your home, as well as for your own comfort. A well-maintained HVAC unit increases your home’s value and delivers cool air on the hottest summer day, while enveloping you with warm, toasty air on the coldest, wintry night. One of the simplest maintenance tasks is simply changing the air filter. When the air filter becomes clogged, then the HVAC unit must work harder. When the unit works harder, you pay more in energy costs. Most manufacturers recommend changing the air filter at least every ninety days. However, for homeowners with pets, more often may be necessary as pet hair and dander can clog airflow quicker. By changing the air filter on a regular basis, you can increase airflow and extend the life of your unit. A good rule of thumb is too check the filter on a monthly basis and, if it looks clogged, go ahead and change it. Another simple maintenance task that you can do in between maintenance check-ups, is to check around the unit and remove any debris. When mowing, you should always make sure you mow so that the grass is blown away from your heating and air conditioning unit as this debris can potentially clog air intake and thereby reduce airflow. Plus, with fall almost upon us, the leaves will soon be falling and they can also block the units from receiving adequate air flow. One way to look at it is whenever something is obstructing the airflow to your unit, it is costing you money that you could be saving or spending on something else. A good rule of thumb is to maintain a perimeter of two feet around your air conditioning or heat pump unit that is clear from all debris, including grass. Also, make sure you check the ductwork periodically to ensure there are no major air leaks, tears, or other issues. Remember, sometimes stray animals manage to sneak under the house and they can cause significant ductwork damage. Of course, if you prefer not to go under the house, then consider purchasing a maintenance plan for your heating and air conditioning unit, which includes an annual inspection of the unit, ductwork and safety inspection to ensure there are no carbon dioxide leaks. It is important to have an experienced Berico technician perform annual maintenance tune-up each year. Not only does this extend the life of your equipment, add efficiency on your fuel and electric bills, lower repair costs, but it is also mandated to uphold any manufacturer warranties you may have on your heating or air equipment. Berico Heating and Air Conditioning offers preventative HVAC Maintenance in Greensboro, NC. Call us at (336) 496-1039 to discuss a service plan that can help ensure that your heating and air conditioning unit is running at its peak performance all year long.